make a living from bees through a combination of honey sales, pollination services and selling bees. A commercial producer manages over 200 hives and average 24 years of bee experience. supplement their primary income and manage from 10-199 hives and average 9 years of experience. do not rely on their bees for income and manage fewer than 10 colonies. They average 7 years of experience. Honey from Asia that has been tainted with illegal animal antibiotics and heavy metals. The FDA has banned chloramphenicol as an antibiotic which is used extensively in Asia to treat foulbrood and was extensively filtered to remove proof of contaminants. Indian honey was made from artificial sweeteners. 60% of what is imported – 123 million pounds came from laundering points. 46.3 million lbs was smuggled into the U.S. by China and 45 million lbs from India. Tests show that 75% of honey on grocery store shelves does not contain pollen. It is our opinion that honey that has been micro filtered to remove pollen is not honey since the nutrients from the honey and the means by which honey can be traced back to its origin have been removed. “For the rest, whatever we have got has been by infinite labor, and search, and ranging through every corner of nature; the difference is that instead of dirt and poison, we have rather chosen to fill our hives with honey and wax, thus furnishing mankind with the two noblest of things, which are sweetness and light.” -Jonathan Swift, Gulliver’s Travels. 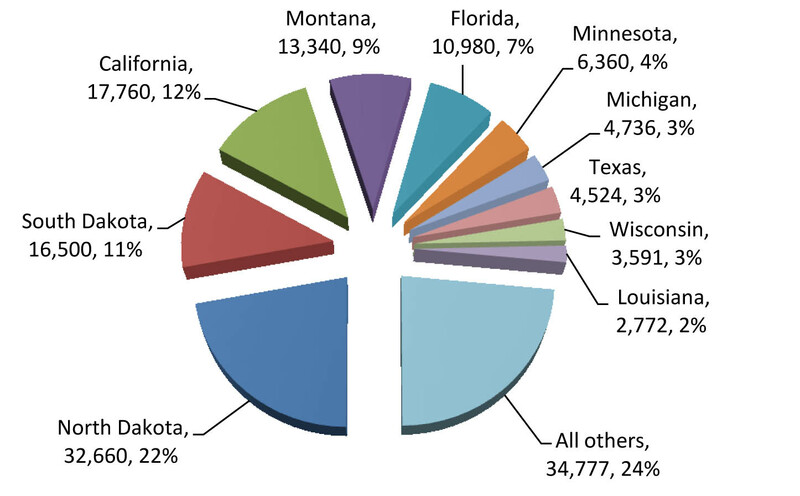 10 states produce 77% of the total domestic honey supply. Top producing states are North Dakota, South Dakota and California. 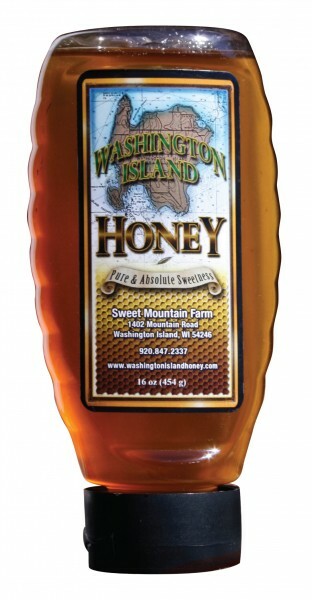 In 2011 domestic honey production was 148 million pounds. 24 years ago, the U.S. produced 220 million pounds. The attrition is foreign competition, imitation honey, and unhealthy bees (i.e., Varroa mites ‘80’s and CCD ‘06. Production is primarily dependent upon bee health and weather. In 2011 with 2.5 million colonies, each hive produced, on average, 51 lbs of honey. USDA has estimated that there are between 139,600 and 212,000 beekeepers in the United States. A 2012 survey conducted by Bee Culture Magazine suggests that there are 115,000-125,000 beekeepers in the U.S. 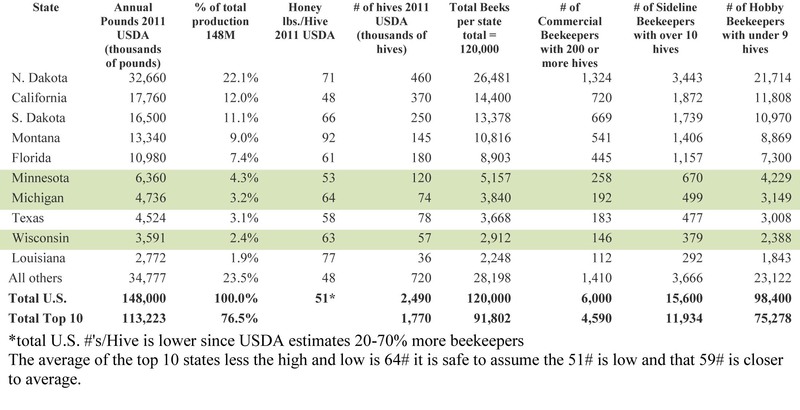 Using the Bradley University Survey of 1,300 beekeepers along with the USDA honey production data, the following table was extrapolated to show the population of commercial, sideline and hobby beekeepers by state. It assumes there are 120,000 U.S. Beekeepers. 50% of the population directly purchases honey, 35% never eat honey, the remaining 15% consume honey in products made with honey (i.e. Honey Cereals, Honey Roasted Peanuts, etc.). Total U.S. consumption was 410 million pounds in 2010 according to USDA’s Economic Research Service. The U.S. per capita consumption of honey is around 1.3 pounds per year. The honey consumer eats between 2-2.5 lbs per year. Industrial honey accounts for 45% of total domestic consumption. The primary industrial users are bakery, health food and cereal manufacturers. The food service industry consumes another 10% of domestic consumption.